BMW is unquestionably one of the most acclaimed brands in the automotive industry. Since its inception, this German automaker has earned the love of auto enthusiasts by coming out with performance packed products with stylish designs and luxurious interiors. The BMW 7 Series is the flagship model and perhaps the most luxurious product in its portfolio. Last year, it entered into its sixth generation with subtle changes to its exteriors and interiors. This new generation version has now been launched in the country at the Delhi Auto Expo. Lets explore this majestic machine in a little more detail. 1. Major refinements to its exterior and interior styling. 2. Innovative features with cutting-edge technology. 1. Waiting period for the car is too long. 2. Although, its power gets an improvement, it still needs refinements to its drive dynamics. 1. BMW Gesture Control is a first-in-class feature that simplifies operating infotainment system and other functions. 2. M Sport package renders it a design trait of a sports saloon. 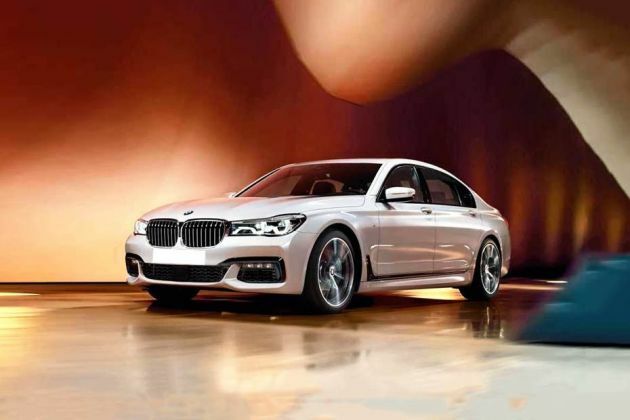 BMW 7 series is one of the most desirable luxury saloons in the automobile world. The German automobile company has launched its sixth generation model here in the country, with same variant line-up like before. Among those, the BMW 7 series 730Ld M Sport is the locally produced diesel trim that comes with an exclusive character package. This latest edition gets several updates with regards to every aspect of the car. It has exterior design traits of a modern car, thanks to the exclusive M Sport package. This new car from BMW will now take on the likes of S Class and A8 in the high end luxury saloon segment. The exterior designing of the car has improved to a new high and the exclusive M Sport package compliments its brand new appeal. Its front facade has undergone a complete overhaul making it look more dynamic than its predecessor. BMW's signature kidney bean shaped front grille has been pronounced and it gets a thicker surround with chrome silver inserts. Body colored bumper gets bigger air breather divided into three sections that adds to its sporty characteristics. On the side profile, much of the design remains the same like its predecessor. But there is a chrome strip affixed to the lower section of the doors rendering it the grace of a luxury saloon. Its window sills are also done up in chrome silver accents. Moving to the rear end, we can see the redesigned taillight cluster with dynamic lighting set-up. There is a chrome strip running through the width of the car. Adding to this, the company's emblem in the center compliments its exclusivity. The interior of the car exudes the sense of richness from every corner. Though much of the design remains to be the same, improvement in the quality and color scheme is what brings a refreshing theme to the cabin. Dashboard gets a minor tweak, but it looks no different from the predecessor. It houses equipments like 10.25” touch display infotainment system and other controls. The instrument cluster comes in a dual pod design featuring speedometer, tachometer and other vehicle information. Panorama glass roof with Sky Lounge with integrated LED light graphics is the new feature that adds to the customer excitement. The steering wheel has an exclusive design covered with premium grade leather and mounted with multiple controls switches. Also, this car gets a rear seat entertainment package featuring two tilt-able 10” screens in HD resolution along with accessibility to vehicle functions and connectivity ports. There are few more features provided inside the car such as an automatic air conditioning, front row arm rests with storage spaces, climate comfort laminated window glasses, BMW touch apps & Touch command with multifunction operations, hand free operations, electric seats and other aspects. This saloon from BWM is powered by a 3.0-litre twin power turbo diesel engine that requires only 6.2 Seconds to accelerate from 0 to 100 kmph mark. This engine comprises of six cylinders, which makes for a total displacement capacity of 2993cc. It can unleash a maximum power of 265bhp power at 4000 rpm with a combination of 620Nm torque at 2000-2500 rpm. The power is channeled to the wheels through an advanced 8 speed steptronic sport automatic gear box. BMW driving experience comes with different driving modes that can recalibrate the performance of the car as per your requirement. This powerful engine with exceptional performance can attain top speed of 250 kmph. It can return a mileage of 16.77 kmpl, which is decent. The machine is built to provide best handling and superior ride quality. This saloon sits on an adaptive 2-axle air suspension system that makes for a jerk-free ride quality. Dynamic damper control with infinite and independent damping enhances the experience further. Usage of high strength aluminum in the construction makes it light in weight and brings out perfect combination of driving comfort and efficiency. Electric power steering system with cruise control and servotronic assist along with brake assist is available to enhance the driving conditions. Manufacturer has integrated Cornering Brake Control (CBC) for refined cornering and Dynamic Stability Control (DSC) along with Dynamic Traction Control (DTC) to improve road grip while driving. Presence of Anti lock Braking System enhances the braking performance and makes for a stress-free drive. Safety is always a top priority for BMW. In the latest edition, most of the features have been retained from its predecessor. There are a total of eight airbags placed inside including dual front, head, side and window airbags for the best possible protection to the occupants. The anti lock braking system along with brake assists and cornering brake control eases the handling efforts while cornering. This saloon also gets ISOFIX child seats & child locks on rear doors, electronic vehicle immobilizer to avoid vehicle theft, active protection assistant and crash sensors. Side impact protectors, reinforced side walls and warning trails are incorporated to deal with side collisions. BMW 7 Series in its sixth generation looks far more desirable than any of its previous versions. It has evolved as the most luxurious BMW ever with technological advancements and state-of-the art features. There is no doubt that this saloon outperforms others in each department. However, with regards to luxury and comfort, Mercedes S Class stands tall in the competition. But one should consider the fact that sixth generation 7 Series is not as pricier as its rivals.